Toronto, ON, August 19, 2015: Microgrids, disruptive technology and cutting edge research were the topics of conversation as a Memorandum of Understanding (MOU) was signed between Ryerson University and India-based Tech Mahindra Ltd. (TechM), a specialist in digital transformation, consulting and business re-engineering. 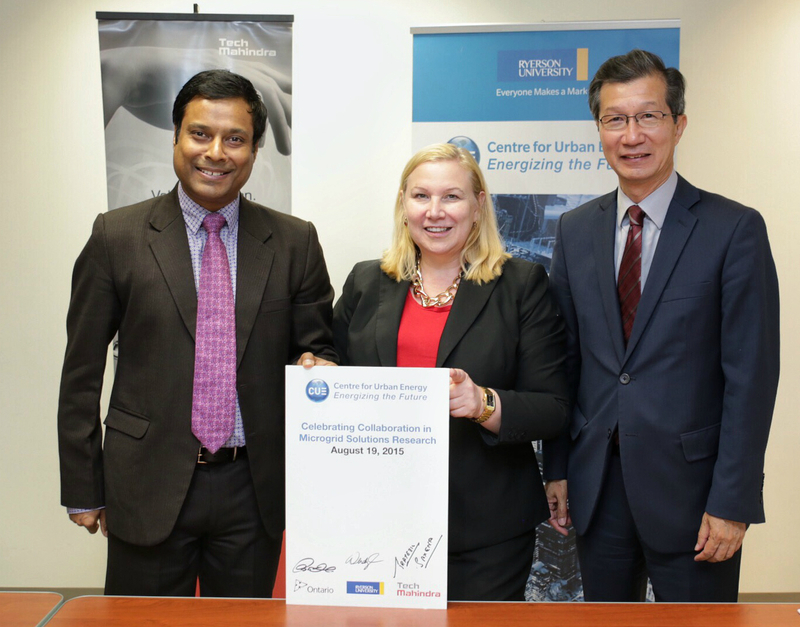 The agreement was made official at the university’s Centre for Urban Energy (CUE), by Wendy Cukier, Vice-President of Research and Innovation at Ryerson University, Prateek Saxena, Director at Tech Mahindra, and the Minister of Citizenship, Immigration and International Trade, Michael Chan. Prior to signing the MOU, TechM Director Prateek Saxena observed, “This agreement between Ryerson University and Tech Mahindra further secures the leadership positions of our two organizations in the next evolutionary stage of microgrid research. Canada is an important part of Tech Mahindra’s success and future. Memorandum of Understanding was signed between Ryerson University and India-based Tech Mahindra Ltd.
Certain statements in this release concerning the future prospects of Tech Mahindra Limited (“the Company” or “TechM”) are forward looking statements. These statements by their nature involve risks and uncertainties that could cause Company’s actual results differ materially from such forward looking statements. The Company, from time to time, makes written and oral forward-looking statements based on information available with the management of the Company and the Company does not undertake to update any forward-looking statement that may be made from time to time by or on behalf of the Company. Please see backgrounder for more technical details.